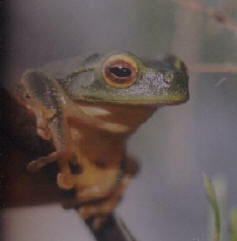 Close relative of the Yellow-thigh Tree-frog, but differs from it by being smaller in size. The hind side of the thighs can be a maroon or reddish-brown colour. Can adopt a inconspicuous flattened posture by holding its limbs tight against its body, closing its eyes and retracting them, thus exposing only its leaf green colouration. May be found on floating vegetations, on reeds in swamps and streams or in shrub or tree foliage along rivers. An average of forty-five millimetres in length. The call is a long drawn out "waaaaaa"
A medium sized, beautiful, bright green frog with yellowish underparts and a patch of dark purple on the back of the legs. The feet are well webbed and with very large, round toe discs. The eyes are black with orange. These frogs are unusual as they will often synchronize their calls so as the calls travel further (Alford 2002), with the result that a tropical wetland with these frogs around it can be quite deafening. They may also utter a pathetic squeak if disturbed or handled. The Graceful Tree Frog is found in tropical streams and swamps, including wetlands quite close to urbanization, in the northern half of the eastern coast of Australia.